When I first saw this app I dismissed it as a gimmick. Some of the reviews on the app store said as much – rubbish, it doesn’t work, con artist – blah, blah, blah. Thanks to Shakeel though I downloaded the app for my iPhone and what do you know – it works! Instant Heart Rate for iPhone (and also Android devices) is a £0.59 app that measures your heart rate. It does this via the iphone’s camera – thats the bit that initially put me off the app. How would the camera detect heart rate? Well, by enabling the flash the camera can detect your heartbeat by the colour variation as the blood flows through your fingers. Fire up the application, click on measure and the flash is enabled. Place your finger over the camera lens and wait a few seconds for the app to settle and start detecting. It will then measure for a few seconds and start displaying your heartbeat. Once measuring accurately you can then store your heartbeat and a simple graph over time will show your measurements. The hastily shot video below shows how quickly it measures your heart rate. I was still a bit sceptical but a few other tests after badminton and cycling confirmed it’s accuracy, tying up exactly with the heart rate monitor on my bike. 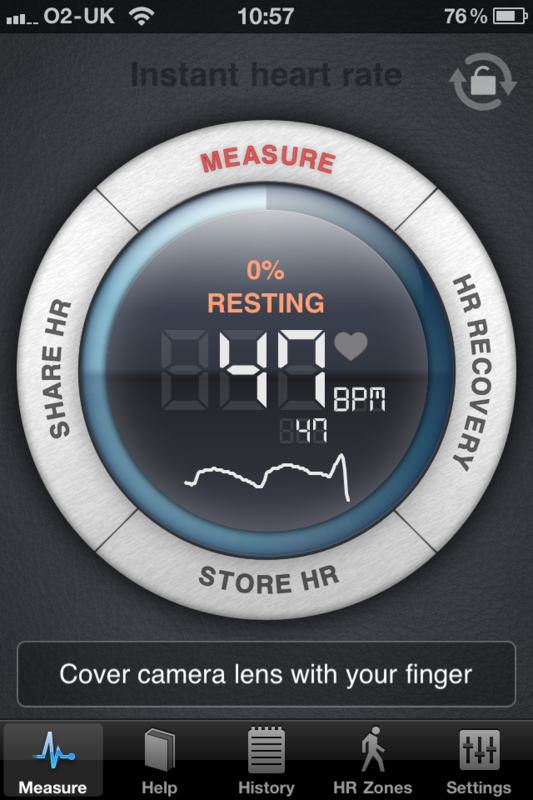 As well as measuring heart rates, the app will also measure your heart rate recovery. The app will measure your rate for 60 seconds after exercise and this can be used as a simple measure of how fit your heart is. Again the app will chart your heart rate recovery over time so if you’ve made a New Years resolution and fitness is a new goal this should give you a way of measuring progress over the year. Couple of updates from after the podcast. The app doesn’t work on the iPhone 3G but does on the 3GS although it needs a lot of light to accurately detect your heartbeat. Secondly, the app is also available for Android devices but I’m not sure on pricing or which devices are supported. A very simple app but great value for £0.59 and definitely an app that impresses people when they see it in action.